Our Beers | Kona Brewing Co.
We brew more than a dozen beers a year, but the regulars are our classic ales and lagers available in all 50 states. Each of these complex, full-tasting beers has a relaxed style and charm about it. Maybe that’s why people reach for them again... and again... and again. The waves in Hawaii are legendary. In the winter months, the island’s north and west coasts see big waves that often climb to 40 feet, with huge curls of white water breaking off shore. This is just one reason why surfers, body boarders, paddlers, and those of us just willing to watch from the beach make this pilgrimage. Big Wave’s lighter body and bright hop aroma and taste make it a natural choice to enjoy with seafood, poultry, salads, and light pasta dishes. Thanks to a legendary local Hawaiian, Longboards have been a constant feature at Waikiki Beach for over 90 years. The great Duke Kahanamoku, father of modern surfing and Olympic Gold Medalist, paddled his handcrafted wooden board—a whopping 16 feet long and weighing 114 pounds—out into the surf to ride the waves off Waikiki. This behemoth was dubbed a longboard and thus the ancient Polynesian sport of surfing was reborn. Today, in the shadow of Diamond Head, Waikiki Beach is still the spot to learn the tradition of longboard surfing. Here you can catch set after set of rolling waves until the sun fades below the horizon, and then it’s time for a Longboard Lager. Longboard Lager typically pairs well with lighter fare but has enough flavor and body to stand up to heartier foods, too. Try some with grilled chicken on mixed greens, pizza, or a sandwich. At the southern tip of Lanai, not far from the island’s first pineapple fields, lies a cobalt blue inlet rimmed with golden cliffs that welcomes divers of every stripe. This is Kaunolu Cove. Catamarans anchor here beside a blade of black rock known as the Moku Noio, where snorkelers explore a dazzling rainbow of tropical fish below and cliff divers soar from the sun-drenched cliffs above. It has been said that the ancient Hawaiians once proved their courage here by making this electrifying 70-foot jump from the famed keyhole notch at the top. Today, you may still see a fearless adventurer leaping from these rocks into the cool embrace of the Pacific below. The infusion of hops and pineapple creates a melody of flavors that compliments a wide arrange of foods. Having a Gold Cliff IPA with smoked pork, grilled ham, or chicken sausage will make any meal a luau. It even goes well with dessert, try it with a piece of moist golden cake and you will have a pineapple upside-down experience that is sooo ‘ono (delicious)! Easy like the islands at just 99 calories and 4g of carbs per serving*! *Per 12 fl. oz. -- Average Analysis: Calories, 99. Carbohydrates, 4g. Protein, 1g. Fat, 0g. Kanaha Blonde Ale pairs well with lighter fare including grilled fish, shrimp, and salads and makes a crisp choice after a long surf session, day at the beach, or office. On the north coast of Kauai, the perfect crescent shape of Hanalei Bay tucks up against lush, green mountains streaked with waterfalls fed by the warm Pacific rain. This is the Hawaii of your dreams. Launch your kayak into the calm blue waters at the historic pier and take in the iconic view of white-sand beaches, the small village of Hanalei, and Makana Mountain (famously known as Bali Hai) towering above you. Paddling from this bay out to the Nā Pali Coast or up the Hanalei River you will discover more natural wonders that can only be seen as you glide through the water. With the sun above and your troubles behind, you might just feel like this place is as close to paradise as you’ll ever get. The southern point of the Big Island of Hawaii is punctuated by two active volcanoes, Mauna Loa and Kilauea. Eruptions from the east rift zone of Kilauea, the longest continuously erupting volcano, send rivers of red-hot lava down its slopes plunging into the Pacific Ocean, with steam clouds billowing from the shore as the lava hits the water. The island is expanding thanks to this force of nature, and Hawaii is one of the few places in the world where you can watch it happen before your eyes. Fire Rock Pale Ale pairs exceptionally well with a variety of foods. Its hoppy character and full body stand up to heartier dishes like BBQ, but at the same time it doesn’t overtake lighter fare like chicken or salads. Try some with nachos or a pesto pizza. Wailua Wheat is a golden, sun-colored ale with a bright, citrusy flavor that comes from the tropical passion fruit we brew into each batch. Imagine traveling along a 90-year-old winding road on the north coast of Maui, crossing one-lane stone bridges that take you back to old Hawaii. This simple “highway” is known as the Road to Hana, a historic fishing village and the birth place of a Hawaiian queen. The Road to Hana is filled with ocean views and cascading waterfalls such as Wailua Falls, a waterfall that plunges 95 feet into a natural pool cradled in the surrounding volcanic rock. Take a dip in the cool, refreshing water under the canopy of palm trees and you will feel the timelessness of this Hawaiian paradise. Wailua Wheat Ale typically pairs well with lighter fare—try some with a strawberry spinach salad, a BBQ chicken sandwich or even a bowl of vanilla ice cream. Our limited release beers are only available in select locations across Hawaii and the mainland. They’re delicious, so make sure to keep your eyes open for them on taps and shelves when you’re out and about! Hand-carved, wooden outrigger canoes once carried Hawaiians from island to island where massive waves would crash over their hulls and toss them toward the horizon. The Ka’iwi Channel, or “Channel of Bones” between Oahu and Molokai was a particularly treacherous route filled with steep, emerald-green volcanic sea cliffs and shark-infested waters. Only the strongest survived these perilous trips, and today, this 26-mile-wide passage challenges champion swimmers and paddlers who continue to race against the high winds and strong currents, earning worldwide admiration and acclaim. It is the early island explorers, and the new ones too, that inspired us to make an equally spirited IPA. Castaway is a cornucopia of island hoppy goodness, which means the sweet and savory flavors of carnitas, mac ‘n cheese, and ham and pineapple pizza pair perfectly with this beer. Lavaman Red Ale is an amber ale with a subtle chocolate malt flavor that’s balanced by our delicate blend of Pacific Northwest hops. Delicious, full-bodied, and roasty, it always goes down smooth. Maui’s beaches weren’t always so serene. Rising above the white sand and breezy trees, Haleakala is a towering reminder of the great volcanoes that rose out of the sea to form our paradise. Legend says the demi-god Maui climbed its summit to lasso the sun, giving Hawaii its vast skies and bright days, and inspiring Haleakala’s name: House of the Sun. These days, runners set out into the crisp night air to trek across ancient red rocks and around cinder cones on their way to Haleakala’s tallest peak, Red Hill, just in time to capture their own sight of Maui’s stunning sunrise. Lavaman Red Ale pairs well with smoked and grilled meats. And its full malt flavor and hoppy character also stand up to delicious rich and tangy sauces. 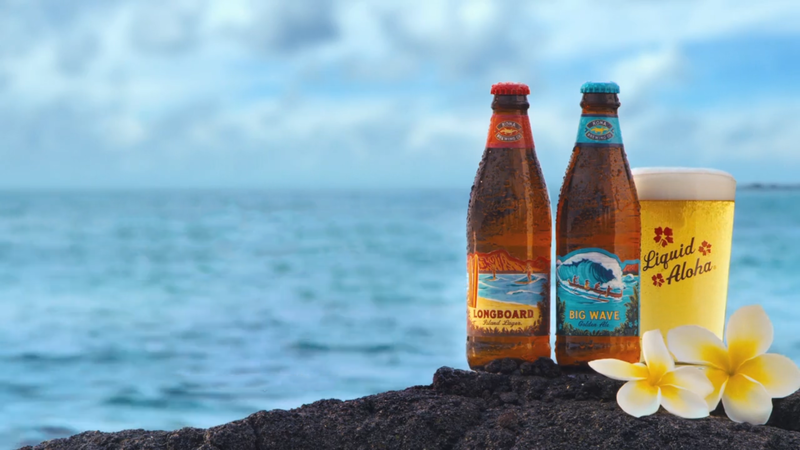 This Aloha series is comprised of three unique island-inspired beers, containing ingredients that bring the flavors of Hawaii to consumers on the mainland and throughout the islands. Each beer—Koko Brown Ale, Kua Bay IPA, and Hibiscus Brut IPA—is available for a limited time. Kua Bay IPA is a bright, bold, copper-colored India Pale Ale. Piney hops, spices, and a subtle caramel maltiness make it a delicious beer that’s both full-bodied and flavorful. The bold, hoppy flavor profile of this IPA makes it a willing and able candidate to stand up to the biggest of flavors—from blackened ahi tuna to spicy chicken wings. Rising from the crystal-blue waters along the North Shore of Oahu is perhaps the most intense surf spot in the world: the Banzai Pipeline. Giant winter waves can surge more than 30 feet, curling into spectacular tubes before crashing over the shallow reef and thrashing even the world’s best surfers. For generations, the Pipeline has lured waveriders from far and wide to try their board in its barrels. And when they feel the rush, it leaves them wide-eyed and craving more. Kona Brewing Company honors this mecca of surfing with a beer that delivers a little kick and thrill of its own. Pipeline Porter is perfectly paired with hearty soups and stews, roast beef sandwiches, pot roast, and mashed potatoes. Its smooth Kona coffee profile also makes it an ideal beer to pair with dessert. Sometimes it can be hard to commit to just one Kona. Our variety packs mix and match different flavors so that you can get not just one, but three or four tastes of Hawaii in each. Our original variety 12pk features our sessionable, flagship beers Big Wave Golden Ale and Longboard Island Lager as well as two IPAs, Castaway IPA and Kua Bay IPA. This variety pack, available in Hawaii and across the mainland, will take you from island to island with every sip of Liquid Aloha. Our newest variety 12pk, Liquid Aloha, features three of our favorite sessionable, fruit-forward beers that are the true definition of Liquid Aloha. This select 12pk includes Hanalei Island IPA, Wailua Wheat, and Kanaha Blonde Ale and is available in Hawaii and the Southwest Region of the mainland. We locally brew several limited batch beers which are creatively crafted, feature special local ingredients, or have local charity components. Hibiscus Brut IPA is brewed to celebrate 25 Years of Liquid Aloha! Gorgeous with a light rose hue, this beer is clean and dry with amped up use of Nelson Sauvin and Hallertau Blanc hops to play to the vinous character of the style. Characteristically dry and highly carbonated, this beer adds hibiscus for a mild tartness that pairs well with this effervescent style. This crystal clear, bubbly, rose-colored brut IPA can be a great casual drinker or brought out when in the mood to celebrate. We also brew additional draft-only beers that highlight the many talents of our hard-working brew team. These are available throughout the southwest region of the mainland, select locations in Hawaii, and our brewpubs -- they’re worth planning a trip around. Duke’s Blonde Ale is an American, blonde-style ale brewed with just a touch of hops. It’s a light, crisp beer that won’t bog you down, making it a popular choice for the middle of the day. Or really, whenever. Duke’s Blonde Ale pairs well with lighter fare like grilled chicken and mixed greens, fresh mozzarella and basil, or perhaps a Greek pizza. Hula Hefeweizen is medium to full-bodied with a pronounced banana and apple fruitiness and spicy characteristics. These signature flavors and aromas are a result of the special type of yeast used when brewing this beer. Hula Hefeweizen pairs well with many foods and makes an excellent warm-weather quencher. It is light enough to work well with poultry and seafood, but has enough body to stand up to heartier foods like barbeque, sausage and strong cheeses. Black Sand Porter is a robust, full-bodied porter with a pronounced bittersweet chocolate flavor and aroma from the diverse varieties of malt used to brew this beer. The hops do a perfect job balancing the maltiness of this robust and roasty ale. Black Sand Porter is an excellent complement to roasted and smoked foods. Try some with a BBQ chicken pizza or a French dip sandwich. Copyright 2019, Kona Brewing Co.Enjoy responsibly.